(From left) Shell Malaysia Government Relations general manager Ir Ahmad Hadri Haris, Yeo, Hazli, and Dr Cho are seen addressing industry leaders during the panel session. Under Shell’s Sky Scenario, natural gas plays an important early role in supplanting coal in power generation and backing up renewable energy intermittency. KUALA LUMPUR: Natural gas and renewable energy could potentially fuel a sustainable future in the power and energy industry, the Malaysian Gas Association (MGA) and Shell Malaysia said. 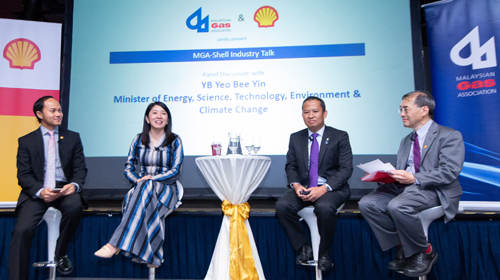 Exploring potential strategies to help the nation achieve its COP21 commitments, the MGA and Shell Malaysia recently co-hosted an industry talk on Shell’s ‘Sky Scenario: Meeting the Goals of the Paris Agreement’, in the presence of Minister of Energy, Science, Technology, Environment and Climate Change Yeo Bee Yin, with close to 100 industry leaders. As the lead advocate for the nation’s natural gas industry, MGA represented by its president, Hazli Sham Kassim, shared the global stance on natural gas being a viable complementary fuel and a perfect partner to renewable energy, co-creating a sustainable future. The Sky Scenario, which represents what Shell believed to be a technologically, industrially, and economically possible route for society to transform to a lower-carbon energy system achieving the temperature goal of the Paris Agreement, was presented by Shell International chief political analyst Dr Cho-Oon Khong. In a press statement, it said, Shell’s Sky Scenario relies on a complex combination of mutually reinforcing actions by society, markets and governments. It reveals the potential for an energy system to emerge that brings modern energy to all in the world, without delivering a climate legacy that society cannot readily adapt to. Shell has been developing scenarios for almost 50 years, helping generations of Shell leaders, academics, governments and business leaders to consider possible pathways when making decisions. Sky joins two other scenarios in Shell’s New Lens Scenarios family: Mountains and Oceans. Elaborating further on Shell’s latest energy-focused scenario, Datuk Iain Lo, chairman of Shell Malaysia said, “Our Sky Scenario builds on earlier Shell scenarios publications and is our most optimistic scenario in terms of climate outcomes. Under the Sky Scenario, natural gas plays an important early role in supplanting coal in power generation and backing up renewable energy intermittency. Across the energy sector, natural gas has been identified to be a perfect partner to renewables, a view that was strongly echoed in the recent World Gas Conference (WGC2018) in Washington, DC. He added, “As the cleanest fossil fuel and coupled with the flexibility provided by gas turbine technologies, natural gas will mitigate any intermittencies in renewable power generation, thus providing a long-term energy solution for a sustainable future.